Gold and silver ... shared by Barb. Can't wait to see what it becomes! Pat's very cool Christmas Tree Quilt! 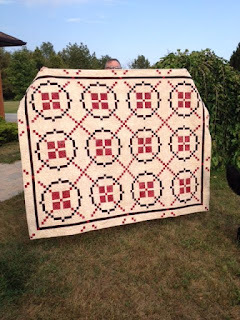 Deelia's wonderful Canada 150 quilt. Both front and back are beautiful! Penny's very cool pillow. Lots of great applique! Yet another beautiful and clever quilt from Cynthia!